Well, after flat lining for months, social distribution gains took an ever so slight dip in September. 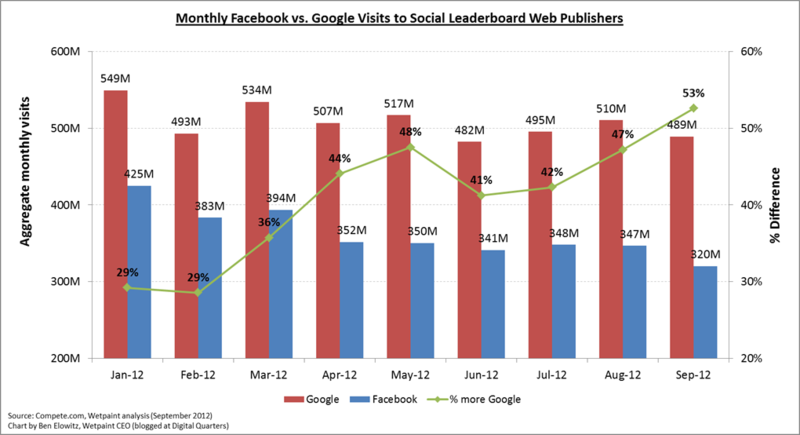 Traffic from social slipped an industrywide average of -0.1 percent from August levels. Even Wetpaint Entertainment, which has been socially strong for several months, saw a hiccup, off by 0.1 percent. Notably, BuzzFeed, MTV and People defied the no-growth trend. You’ll recall that BuzzFeed made its Leaderboard debut last month with a 15.6 percent showing that put the social news site solidly in second place, right behind Wetpaint. This month Buzzfeed added a percentage point to its social composition, guaranteeing its second, second-place finish. People also ticked up (0.8 percent) in September. MTV bested its August finish by 2.6 percent. This despite (or maybe because of?) news about cancellation of the network’s Jersey Shore series. With that 2.6 percent jump, the biggest among the top 50 web publishers, MTV retained its #3 spot on the Leaderboard for the second month in a row. People finished September in fourth place. For the most part, absolute social volumes were relatively stagnant, just as the relative social percentages were. But there were two notable exceptions. Fueled by the kickoff of its 2012 football season, NFL social traffic totals for September spiked nearly 60 percent (5.2M compared to August’s 3.1M). While less dramatic, CBS’s September figure (2.1M) beat its August showing by 0.5M, continuing the network’s four-month-long upward trend in social traffic totals. And Wetpaint inched past MTV, moving up a slot (from #8 to #7) in Leaderboard volume rankings. Google and Facebook are the two most powerful traffic distributors on the web, as measured by how many clicks they send away from their own websites to those of third-party publishers. While the traffic Google sends the top 50 publishers has been bouncing up and down, Facebook has had a much more decisive trend: Facebook is getting stingy. Corroborating complaints from a number of publishers and app developers that Facebook is putting the squeeze on the ways they use the platform to promote themselves, the analytics show that Facebook has been getting progressively stingy at sending traffic out – forwarding 25% less traffic to publishers now than at the beginning of the year. And I suspect that this trend will continue as long as the post-IPO Facebook keeps its focus on generating ad revenue for itself rather than supporting those who use its platform.